Cranberries make a great addition to traditional Thanksgiving and Christmas meals, and their naturally tart flavor provide a great contrast to the rich roasted meats and sweet desserts popular this time of year. 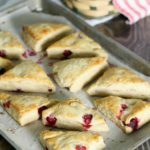 These cranberry scones are no different, with just the right balance of sweet and tartness making them suitable as a breakfast pastry, or served in the afternoons with tea! This deliciously tart and healthy fruit, popular in Fall and Winter months across North America, is most commonly associated with Thanksgiving and Christmas. While cranberry products are readily available year round,(such as in juices, jams, or even dried) fresh cranberries are generally in season from early October to late November. A good source of Vitamin C and Fibre, ( along with other micro nutrients and minerals), cranberries where an obvious choice and welcome fruity addition to the diets of Native Americans and early settlers who first foraged and grew them here in Canada. Both scones and biscuits are leavened (raised) with baking powder and are considered a quick bread. Before baking powder was commonly available to the general public though, scones where cooked on hot griddles and where a lot flatter and denser then the soft baked good we know today. Essentially a large and flat quick bread, the cooked scone (also called bannock in Scotland), would then be cut into triangles and served as individual ‘scones’. These scones could be lightly sweetened with fruit and honey or made to be savory with herbs and spices. Biscuits are served as an alternative to bread and rolls, where scones are generally considered a sweet baked good. 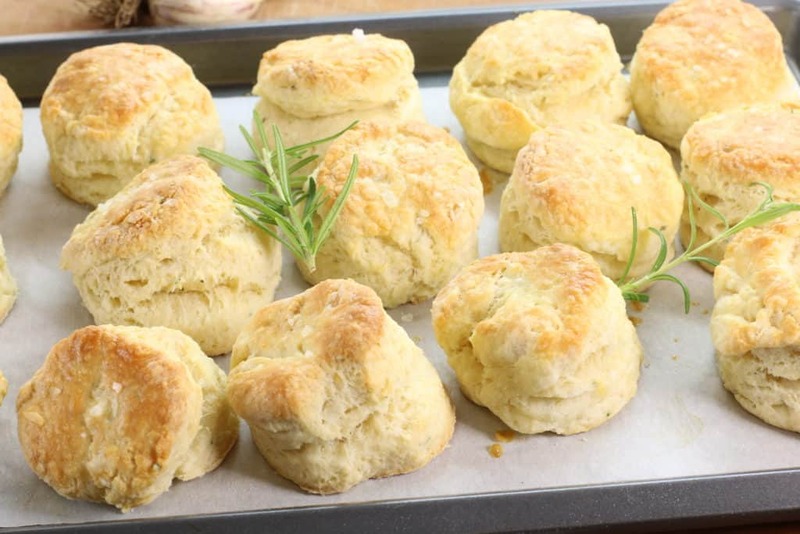 Biscuits on the other hand are generally savory, such as my Rosemary and Garlic Biscuits, and are most commonly served as an alternative to bread or rolls at supper. Where scones usually incorporate cold butter in the recipe, biscuits traditionally used lard or vegetable shortening instead. As such you are more likely to see a scone served in a coffee shop as a baked good instead of a biscuit! Even a first time baker can attempt this recipe and walk away with a product that will impress anyone! Before you start pre-heat your oven to 400F and line a sheet pan with parchment paper or Silpat, a re-usable silicone alternative to traditional parchment paper. Start by mixing the flour, cinnamon, and baking powder in a mixing bowl. I would advise against using an electric mixer for this recipe as over mixing the dough can create hard and dense scones. It’s better to simply use a fork or better yet, your hands to mix the ingredients! Continue by mixing in the cold cubed butter and crumbling it up in the flour until there are no large chunks left. Once the butter is mixed in and the bits are roughly pea sized or smaller, you can add the frozen cranberries and the brown sugar. You can use fresh cranberries if you have them, but I find frozen cranberries tend to “bleed” their color less and will stay nice and juicy, giving a nice tart pop on the scone! Only a few steps left! Pour in the milk and use a wooden spoon to mix the cranberry scone dough together. It should be slightly moist, and soft. Sprinkle some flour on your counter top, and then turn out the dough on the flour. Sprinkling the counter with flour helps prevent the dough from sticking to the counter and creating a mess. Knead the dough a few times to help bring it together and create a smoother mass. You can sprinkle a little more flour on it if you need to. Then with a rolling pin, roll out the cranberry scone dough until it is about half an inch thick. If you find the dough is still sticking to the counter and rolling pin you can flour the top and bottom of the dough some more. just don’t mix more flour into the dough! Once the cranberry scones are rolled out, you can cut the scones into any shape you like. Triangles are traditional, but you could also use a ring mold, and punch out rounds or any other shape you like! Arrange the individual scones on your parchment lined baking sheet, and place the sheet in the middle rack of the oven at 400F for 12 to 15 minutes. Pre-heat your oven to 400F and line a baking sheet with parchment paper or silpat. Mix the flour, cinnamon, and baking powder together in a mixing bowl. Mix in the cold cubed butter, just like you would if you where making pie dough or homemamde biscuits. When the mixture is crumbly and no large chunks of butter remain, stir in the frozen cranberries and brown sugar and mix well. 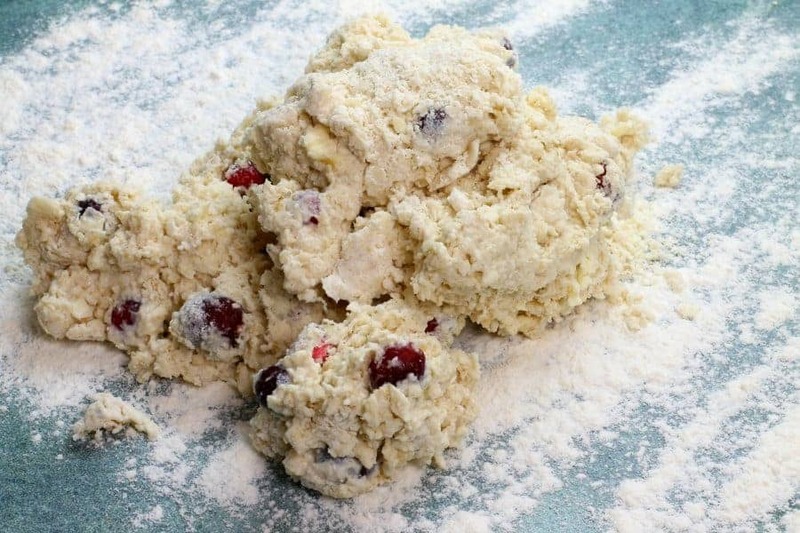 Add the milk to the cranberry scone dough, and mix until a soft and sticky dough is formed. turn the dough out on a floured counter-top, and knead two or three times to smooth out the dough. Add a little flout if the dough is very sticky. With a rolling pin roll out the dough until it is about half an inch thick. Then cut the dough into individual cranberry scones. The shape is entierly up to you but triangles are traditional! Arrange the scones on your baking sheet, and brush with milk, then sprinkle with sugar. Bake at 400F for 12 to 15 minutes. 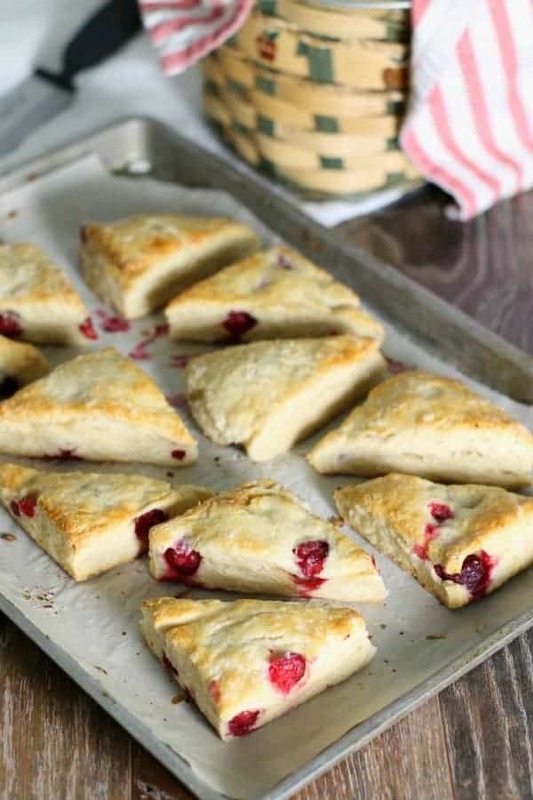 Cool the cranberry scones on a wire rack or serve them warm for breakfast or brunch! Brush the tops of the cranberry scones with milk, and then sprinkle with sugar for a crisp golden crust! Can the cranberries be replaced with other fruit in this recipe ? 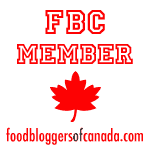 I love this idea because I feel like the cranberry + white chocolate scone is overdone! And, way too sweet for a scone. So, your recipe sounds great! I agree! scones should not be overly sweet, especially if serving for breakfast! They certainly are perfect cranberry scones, Markus – your description and step-by-step photos are wonderful. It makes my mouth water just looking at them. Thanks for sharing. Glad you enjoyed the recipe Denise! I can make good use of my frozen cranberries now by making your scones for breakfast on Sundays. They look so flaky and tempting. I bookmarked your recipe so I don’t forget. Thanks so much for sharing. I’d love to see how they turn out! Tag us on instagram @earthfoodandfire when you do make them! You can also use other fruits, doesn’t have to be cranberries!